Description: Experiencing abundant joy and dynamic power is possible for every Christian today. But first, we need to focus on the image and personality of Christ. Andrew Murray paints a portrait of the Son of God that will arouse your desire to be like Him. 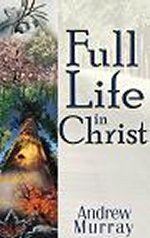 Depicted in these pages are many characteristics of Christ, including His compassion, His self-denial, His oneness with the Father, His prayer life and use of Scripture. You will discover how you can have a full life in Him and how you, too, can reflect the image of the Father in your daily walk.